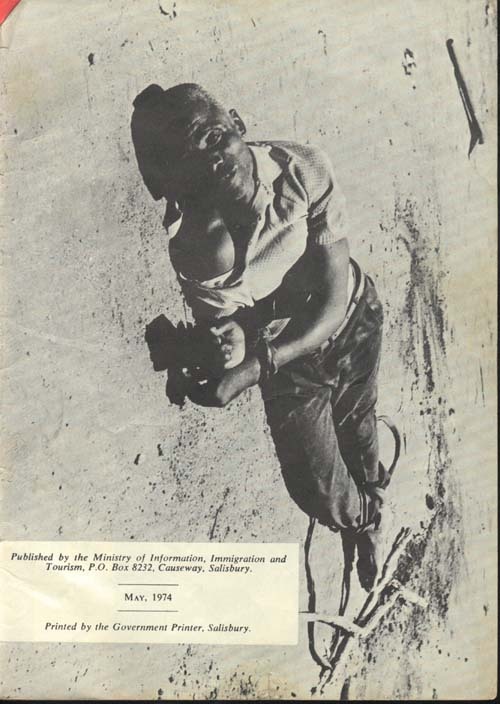 Here you will see a very rare publication. 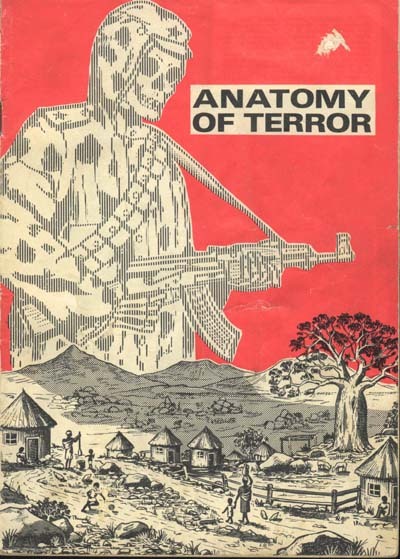 It was produced by the Rhodesian Government to show what the black Liberators did to their enemies and to those they suspected of working with the whites. Terrorism was also used as a way of getting the population to go along with them. 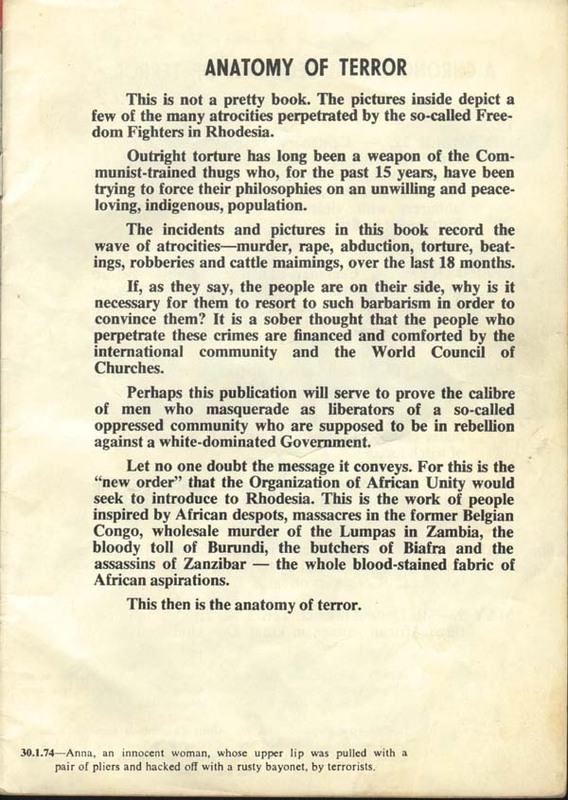 The Liberators considered anyone who co-operated with the whites to be a "sell-out" or a traitor. They used sheer terror to prevent blacks from being friendly towards the whites. 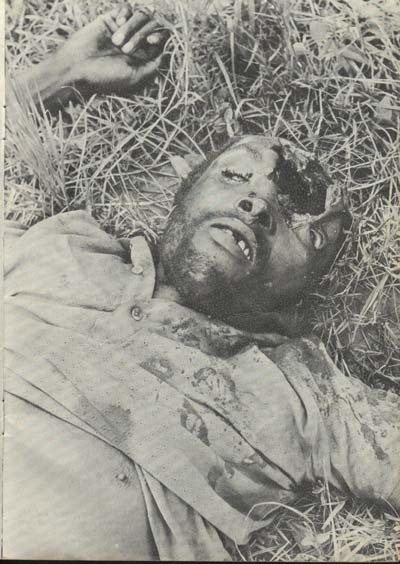 Any moderate black, who co-operated with the whites, was in danger of being beaten, or, worse still, murdered in the most brutal fashion imaginable. The Liberators were not nice, kind, democratic people. They were people who were hungry for power and who used any means to get it. 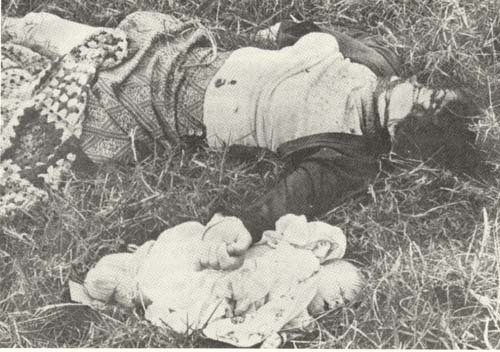 They killed black and white civilians alike in a reign of terror in order to get their way. It is worth describing shortly, their basic approach. 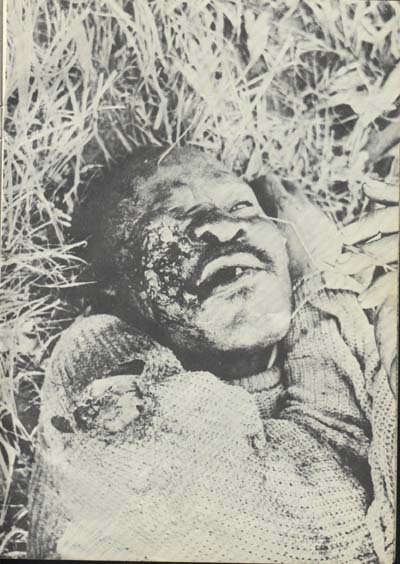 In Zimbabwe, the war was fought in the rural areas, often far away from civilisation. A gang of guerrillas would approach a village and gather together all the people who maybe numbered several hundred. They would try to convince the villagers to support them. They would even teach them politically orientated songs. They would indoctrinate them with Marxist ideology. But then they would warn them of what would happen to a sell-out. 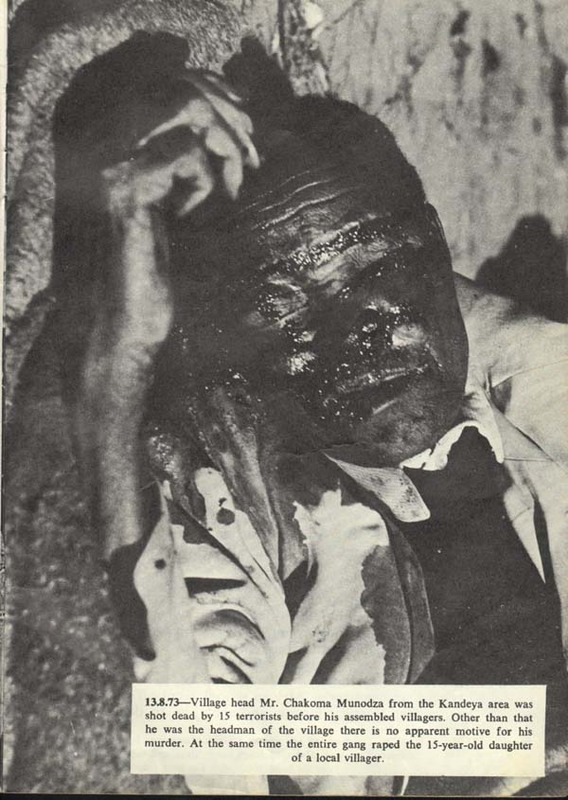 They would then pick a man from the audience, to demonstrate to the villagers what they would do to someone who co-operated with the whites. They might pick a man and then start beating him while forcing the villagers to watch. On some occasions they would begin cutting flesh from his living body. A favourite target was to cut a man's ears, or lips off. They might cut his lips off with a knife or a bayonet or even rip them off with pliers. Then they would call his wife and ask her to cook her husband's flesh. Then they would make her eat it. All this would be done in full view of the horrified villagers. They would beat the man, torture him some more and finally bayonet him to death. 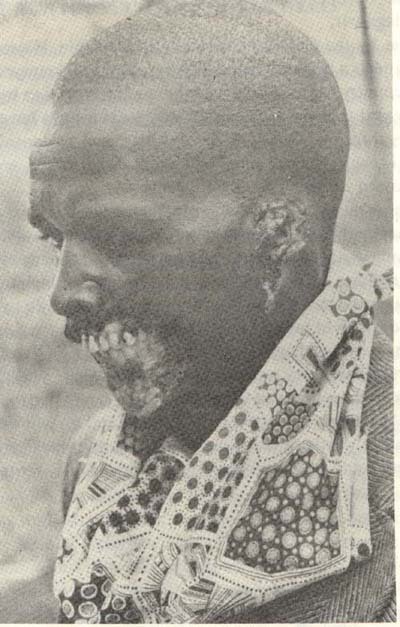 This, they would declare, is what will happen to anyone who co-operates with the whites. 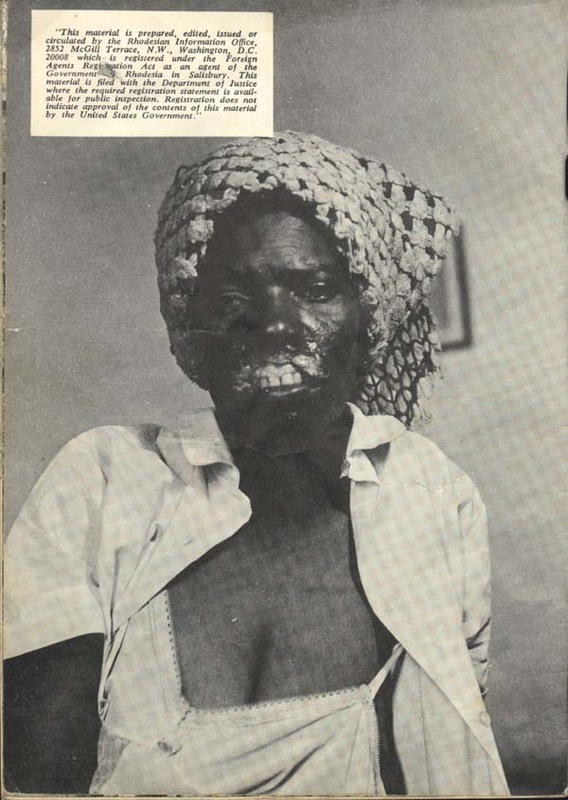 30/01/1974: Anna, an innocent woman, whose upper lip was pulled with a pair of pliers, and hacked off with a rusty bayonet by terrorists. Here is a page you can read which will give you an idea of many terrorist acts for which not photos are available. The list below could continue on and on for the next seven years. This is how Robert Mugabe came to power. These were their tactics. Read, and be disgusted. 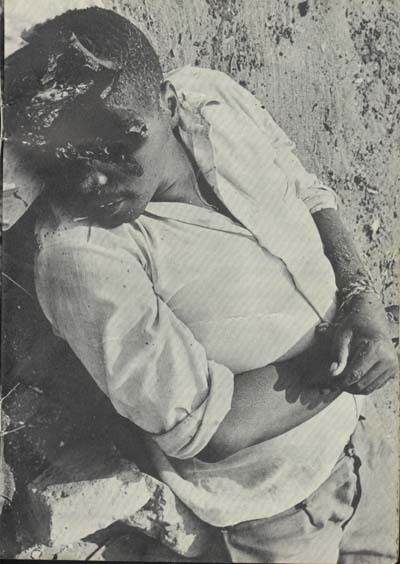 Top Photo: 28/10/1973: Mr. Mkambe Chiqueqwete, repeatedly shot by terrorists at his village. 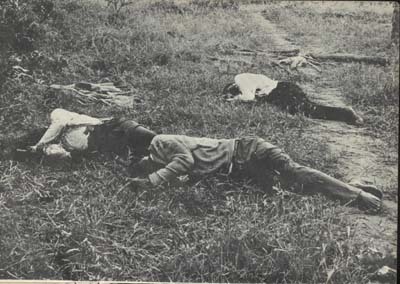 Twenty-three cartridge cases of communist origin were found at the scene. Motive unknown. 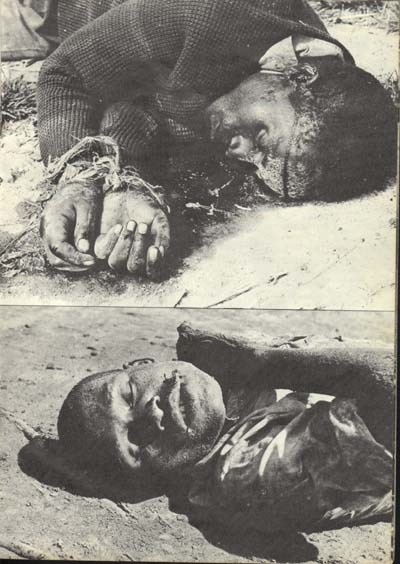 Bottom Photo: 16/04/1974: Four terrorists took Mr. Albert Chigumbuza from his home in the Rusambo area, accused him of being a "sellout" and shot him 15 times. There was absolutely no connection between Mr. Chigumbuza and the authorities. 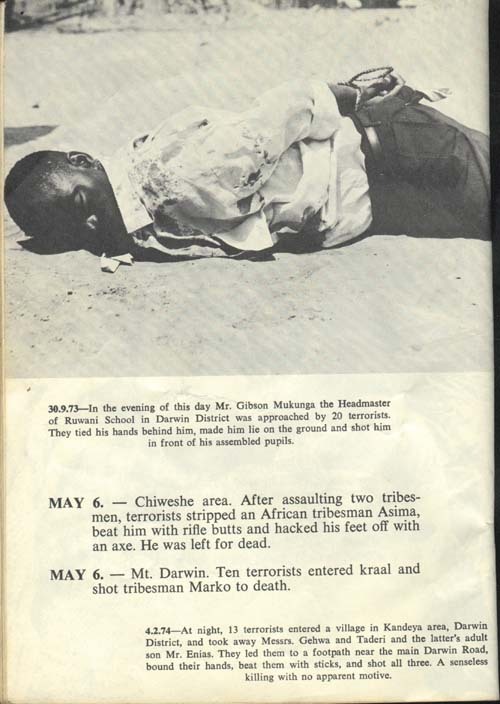 17/04/1974: Mr. Chivarenge was the headman of a village. Ten terrorists approached him, accused him of being a "sellout", tied his hands behind his back and shot him. 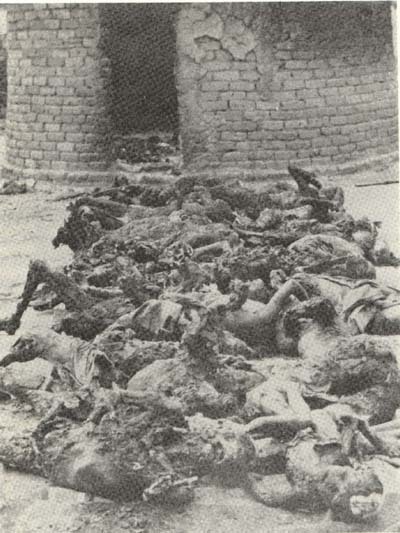 They then shot the 14 cattle which represented the entire village's worldly wealth and then set fire to the village. Mr. Chivarenge had led a blameless life and no motive is apparent. 27/06/1973: The body of one of two Chief's Messengers was found in the Mt. Darwin district. They were abducted from their village and shot through the back of the head. No motive has been found. 18/01/1974: Six terrorists took schoolteacher Mr. Enias Chakwanya and Mr Jairos Kachesa from their village in the Mt. Darwin district, laid them on the ground and beat them to death with a pole. 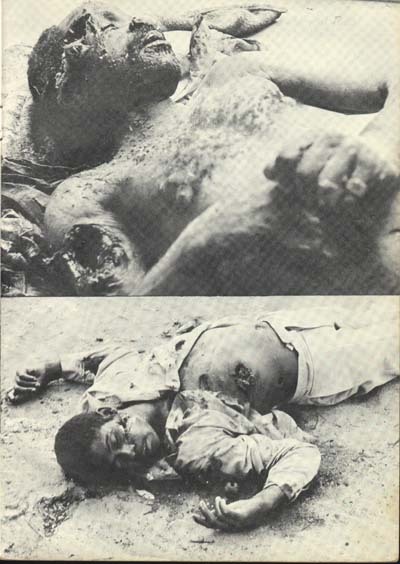 The picture shows Mr. Chakwanya's body. 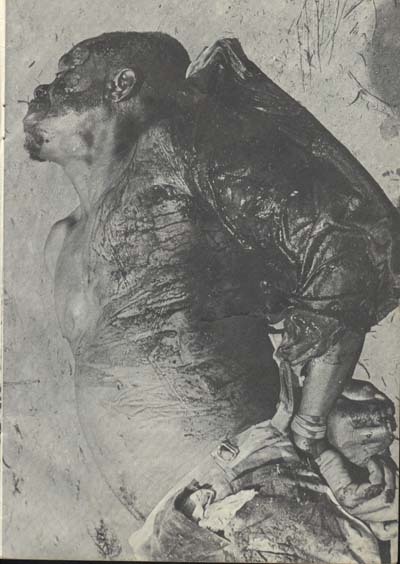 23/09/1974: The body of Mr. Goliat from the Kandeya area who was accused of helping the Security Forces. His hands were tied, he was made to kneel and shot six times. 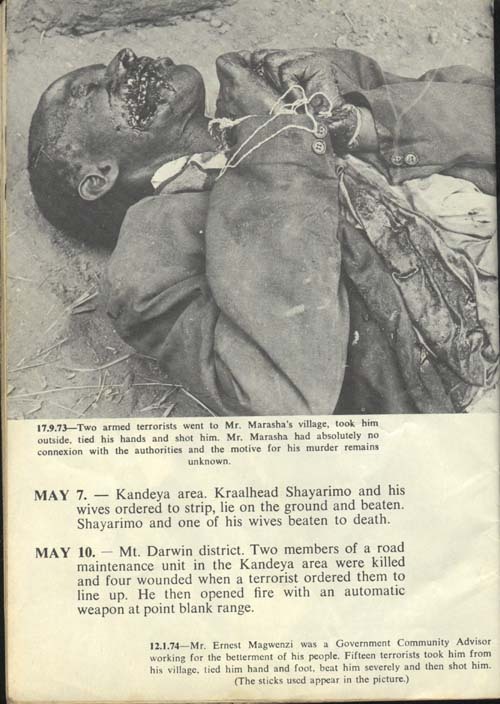 04/02/1974: The victim of a triple murder in the Kandeya area. He was beaten with sticks and shot for no apparent reason. Take note above of the horrific atrocity of 6 May where a man had his feet chopped off. 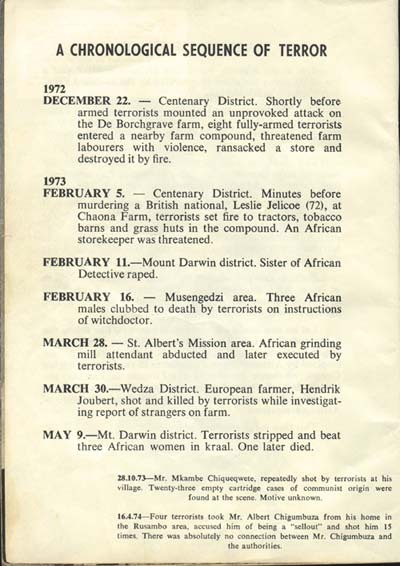 04/02/1974: Thirteen terrorists entered a village in the Kandeya area, Darwin District. They took away Messrs. Gehawa and Taderi and the latter's adult son, Mr. Enias. 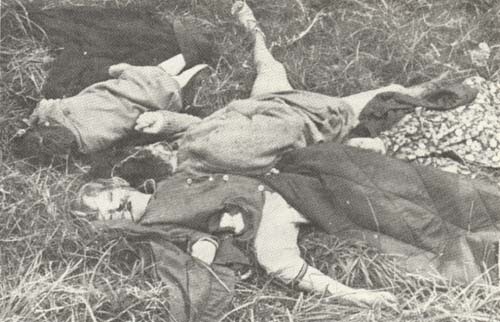 They led them to a footpath near the main Darwin Road, bound their hands, beat them with sticks and shot all three. A senseless killing with no apparent motive. Shades of things to come. 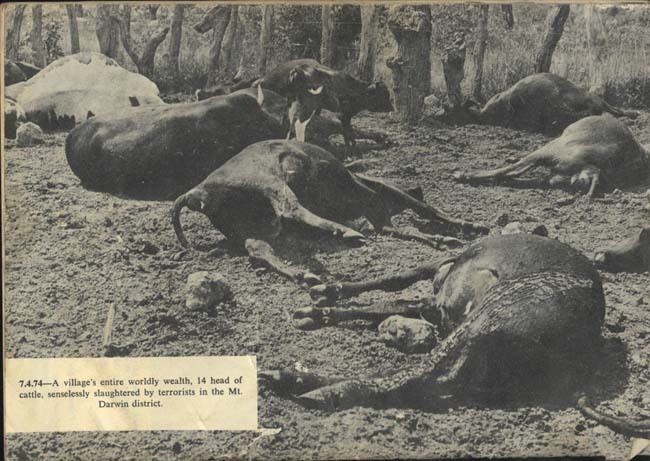 What is different between the senseless shooting of all these cattle in this village and the senseless burning and destroying of white farms in Zimbabwe today? The same old terrorist is at work causing untold senseless suffering just because he craves power. More photos, plus audio and video files.